I have been competing a long time, most rides blur together as time passes into a fuzzy memory of riding. This ride, however, will live on and on as one of my all time favorite rides. Because it was splendid, all around splendid. Everything from the packing to the driving to the camping to the riding to the finish to the camping to the driving home was splendid. And I am walking on clouds. The date of this ride is September 9, 2017. In October of 2016, I became Penny Pony’s new owner. She had never been on a proper trail ride, she had never worked at speed over any kind of distance, she had never been exposed to a group of horses all going at speed and changing leaders along the trail, she had never eaten on the fly or drank from mud puddles, and she was a sorry out of shape stall potato. 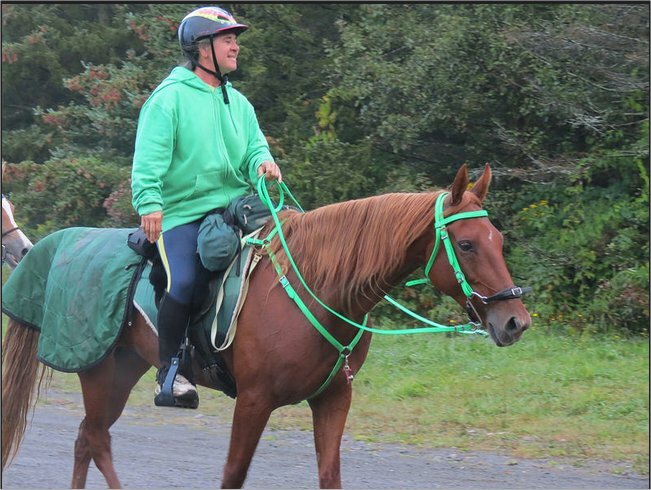 Yes, eleven months ago I started from the worse case scenario of scratch and started to build an endurance horse. She loved every training ride. She loved every mile. As I started taking her to competitions, she grew bolder and bolder. As she began to understand that holds were for eating anything and everything, she grew stronger. As the rides passed by and she became familiar with moving out at speed, she grew faster. Each ride she learned to have better manners in the vet checks. 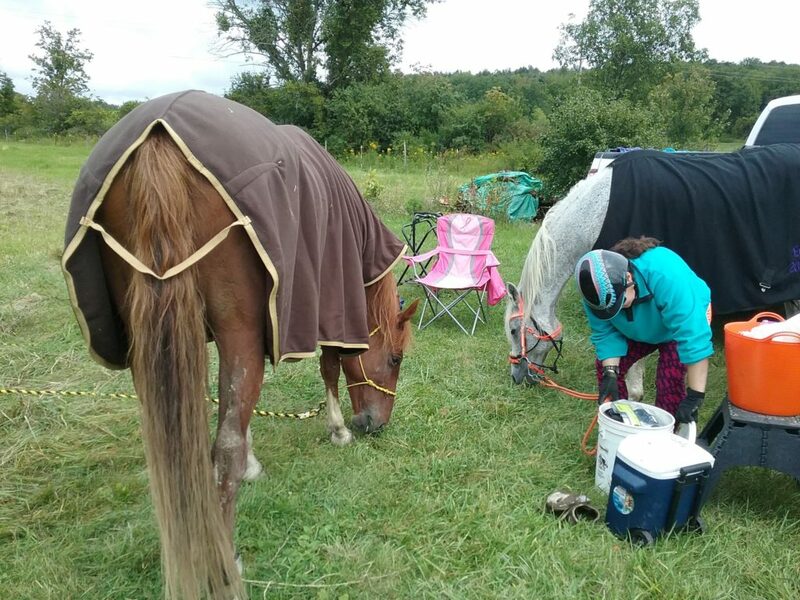 And eleven months later I chose to enter her in her first 50 mile endurance ride, at Hector Half Hundred to find out is she had the right stuff to be an endurance horse. She is eight years old. She is a registered American Saddlebred. 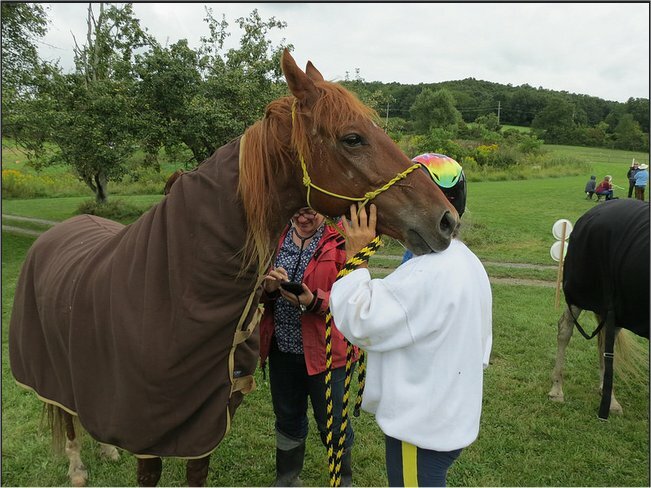 She is a chestnut mare. She is 15hh (small for her breed) and she is one tough cookie! I love her to pieces. Ro agreed to help babysit Penny Pony by navigating Steel around the course. She did tell me that after Muckleratz, with Penny taking off and riding alone that a babysitter probably wasn’t necessary. I told Ro that I might need the babysitter more than Penny Pony, because I haven’t ridden a 50 mile endurance course in over a year. I’ve been concentrating on building Penny Pony’s strength so we’ve been doing 25 and 30 mile rides. Not sure what my body is gonna say at mile 35. She said no worries. Again, we chose to run in her rig (more room, better sleeping arrangements) so I ran all my stuff over the day before to get packed up. Now that I’ve done this once, I know exactly what I need and the transfer of “materials” went very smoothly. Morning of, I did run into a little hitch as Steel decided not to be caught and Penny Pony was afraid to go against Steel’s direct order of “RUN AWAY FROM MISS DODIE.” I had to call Ro and let her know that her horse catching service was needed in my pasture. She arrived and had Penny Pony in three minutes, Steel in five minutes. I had to say to her, “I really hate you right now” because I had just spent 45 minutes trying to get within 150 yards of either of those silly mares. But, now they’re captured and we’re off . The ride to Hector went very smoothly, we had awesome conversations and the four hours flew by. We arrived and Renee had saved a parking spot next to her, right in front of the vetting area. Sweet spot. 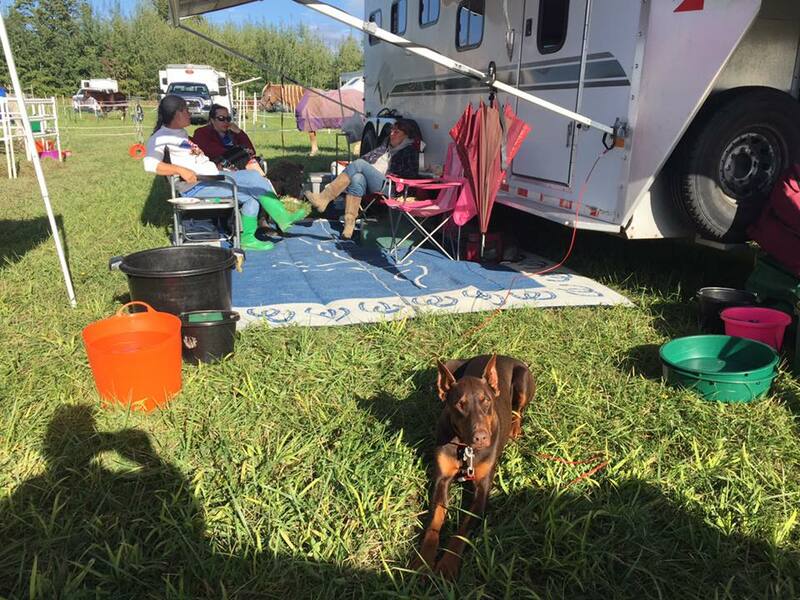 We got all unpacked and settled before the first round of showers arrived. After that round of showers, we took advantage of the sun peeking through the clouds to run down and get vetted. All A’s for both girls. We got back and put them into rain coats, minutes before the second round of showers arrived. While it showered on and off for the remained of the evening, and did get quite damp and chilly, we were all having the time of our lives visiting and getting ready for tomorrow’s ride. We were underneath Renee’s canopy and dry. Do not make fun of my green boots, they keep my feet dry! Now, I had already told Ro that she was not allowed to have any chicken. (See the Muckleratz story) I was teasing her, of course, but guess what we had for supper? Oh yes, chicken on the grill. It was delicious but I watched Ro like a hawk while she picked at her chicken. I tried not to be too obvious about it (chuckle) but I believe she did notice me. The temps for tomorrow’s ride was predicted as this… starting the ride, upper 40’s and foggy/misty weather predicted. The day’s high was predicted to be only 58. (Yes, it is the beginning of September and we’re having October weather. I suspect it is because Hurricane Irma is pulling the coldness down as she hurtles towards Florida) This means a good ride for the horses, because they will stay cool, but they will have to be managed very carefully so that they do not get chilled and cramp up when stopped in the vet checks. Ride meeting. Now, I have been doing this sport for a very long time. I have also managed a couple CTR’s and one END ride. I am “NOT” one to get involved in what the ride manager or the ride vets are saying. I did have to speak up at this meeting, however. The head vet stated tack off at every hold. WHAT???? Tack off means cold backs and a higher potential for cramping. The room went silent. (crickets) All riders were either in shock that I dared to question a ride vet, or they were holding their breath in anticipation of a change in the vetting. Well, that’s that. We had Steel and Penny in rain coats for the evening, it’s getting dark by 8:00 pm and we’re all ready for bed by 9:00 pm. Start time is 6:30 am for the 50 mile riders. Plan for the morning, let’s keep Penny’s head on straight so we’re leaving after all the 50’s are out. She has been doing really well about not getting excited when the ride starts, let’s keep it that way. I took Steel and Penny for a warm up walk around 5:30 am and they thought that walk was all about eating grass, and not warming up. That’s okay, grass is good, too. Back to the trailer and breakfast for everyone. I was very disappointed in the breakfast provided by the ride. I didn’t bring any fruit with me because they said they were going to feed us breakfast. Well, no bananas, no fruit of any kind, no yogurt, only bagels and plain cream cheese. DAMN! I am not eating that before going out and riding. I grabbed a cup of very weak coffee and went back to the trailer to did in my snack box for something to eat for breakfast. 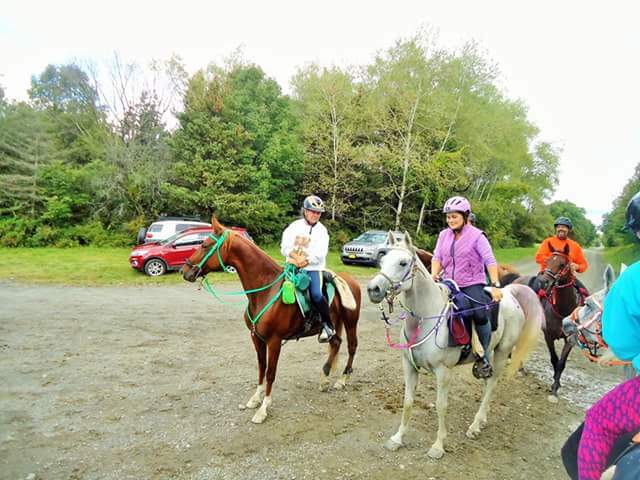 We sat around for a bit discussing the trail (as we remembered it) and then got the girls out to get saddled. At 6:30 am they called TRAIL OPEN and we got on and started walking away from the start line. And at 6:45 am, just as I planned, we started on trail, fifteen minutes behind the pack. There were two people following us, so in reality we weren’t dead last. Close enough for a cigar. And we’re off and Penny is out in the lead. This mare has no fear! It is cool and damp and even though Ro disagrees with me, I am pretty sure we were actually rained on during the first loop. I dressed in layers, knowing that at some point I would have start peeling like an onion. First loop was pretty interesting for Penny. We passed a pasture full of mama cows and babies. As they were already wound up from the other 40 horses that recently passed them, when we came along the babies started doing their little twist and buck spasms that baby cows do and Penny was like, “Wow! What is that and how do I get through the fence to look at that a little closer?” She was cracking me up as we rode along that fenceline, she was so interested. Into the “common area”, as aptly named by the trail master. It is five miles out from base and we will pass through it several times today. And the first loop is so much fun, I almost died from the sheer joy of it. Through cow pastures (with cows in them!). On single track trail. On dirt roads. And we started passing riders. Penny kept a good head on her shoulders and only really crowded a pair of riders once. Kinda not her fault, we were on some single track trail, we came up on them and they were not working at “Penny Speed” and she was not happy working at their speed (too slow) so she was rude and kept pushing on the back horse. We came out of the single track trail into a large area with water tubs. Steel and Joy wanted a drink but Penny just wanted to get out ahead of those two slow horses. She was spinning circles waiting on Steel and Joy. And they’re off. Now, after doing a mile or so of slow slow trotting, she was ready to kick it up a notch. OH NO MA’AM. We still have 40 miles to do today, kick it down a notch. We were in a pocket at this point. no horses in front, no horses behind and Penny settled into a nice 12 mph easy trot. No effort for her. No work for me. And the scenery was wonderful. Back to the “common area” and five miles back to base camp to have our first vet hold. As soon as we started down that lollipop towards base camp, Penny Pony was ready to kick it up a notch. There were several horses in front of us and she was determined to be the winner. She started pulling on me and gathering herself up under the saddle. I had to make a split second decision. I have learned from conditioning that if I try to hold Penny Pony back, she leans into the bridle and it causes me to have severe back spasms. If I let her go when she gets like this, she will race herself to death. So I have to find a happy medium, which I believe I have finally done. I allow her to speed up, but only to a speed I agree with. I allow her to pass, but she may not “race” pass, she must maintain her pace. I allow her to canter, but she must stay in a frame and in balance. If she does all these things, then I stay off her bridle … and “Ta Da” we’re both happy. I have been practicing this on conditioning rides and at the last two competitions. Today is a test. I knew that Ro and Renee would maintain whatever speed they wanted to and would not get excited if Penny Pony kicked it up a notch so .. (deep breath) .. here we go. I ask her to relax, but allow her to speed up. I look down at my GPS and it says we’re at 14 mph. I allow her to pass, far to the left side of the dirt road, and allow her into a canter. GPS says 16 mph. I am concentrating so I don’t look back to see where Steel and Joy are. She passes, she is on a semi loose rein, we have achieved success. I am learning, she is learning. We have a pretty good team partnership building over these past couple months. I am very pleased with her at this point. She just passed eight horses, on an open straight stretch of dirt road, and did it in a mannerly fashion without flat-lining or giving me a hard time. However, she knows we’re headed back to base camp and she’s not prepared to slow down. No No No. We still have 33 miles to go today. Well, I did look behind me and see that Steel and Joy are pretty close so I allowed Penny to maintain a 13 mph trot back into base camp. I knew we have a 1/4 mile of field to go around, that’s where we’ll slow down and walk so they can all get a breather and start dropping their heart rates. 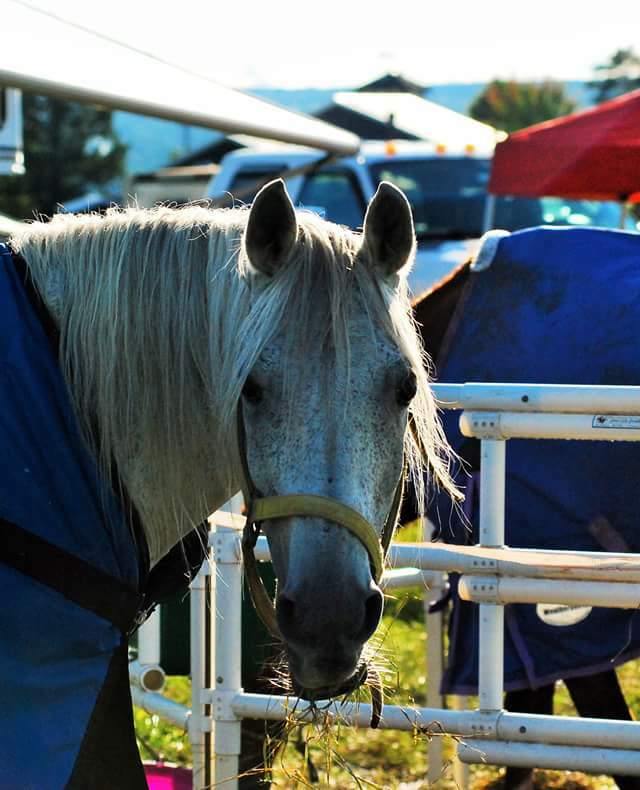 Since we are parked right across from the vetting area, we had decided to crew our horses from the trailer. Okay, as Ro says, we lost some time doing that, and I did remind her that I am not about the time. I have 12 hours to do this 50 mile ride and if I need all 12 hours, then so be it. HOWEVER! I do need to start learning to be aware of time lost in the holds (hold time starts when the horse meets the pulse criteria) because I do believe that Penny Pony will be very competitive, and easily able to top 10, when she gets stronger. I expect that at the end of next year’s season after she has a couple 50 milers under her saddle pad. Okay. Small note to the reader. Ro says it didn’t rain, it was just dripping off the trees from the misty morning fog. I disagree because when I peeled all my layers off, the top layer was wringing wet. Literally, I was wringing water out of my hoodie. I asked Julie to take it out to the away hold and hang it on the truck mirror, in hopes it might dry out a little bit. In case I needed to change clothes at the second hold. I stripped everything and did a complete clothes change. My underwear and socks and everything. I was soaked through and through. I do not have a second pair of half chaps and now I know I need one. When I put them back on they chilled my lower leg due to their dampness. Brrrr. And we’re saddled and ready to go out on the second loop of 18 miles. 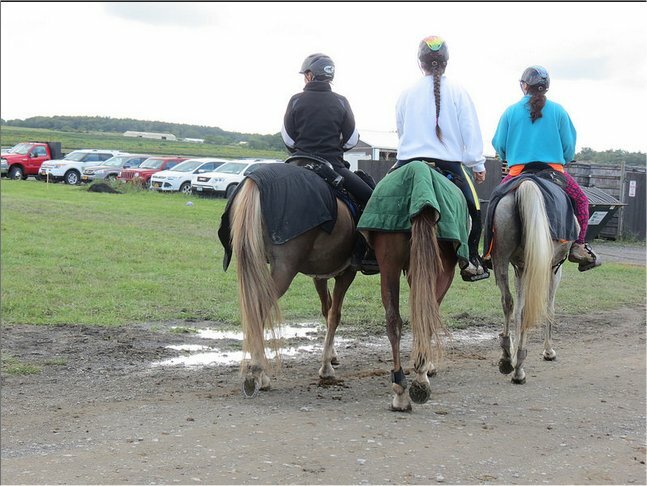 It’s still pretty chilly and I don’t want my horses to cramp up so we left their rumps rugs on. I loved this photo of us leaving out on the second loop. Penny is still on fire and she leaves out on the second loop like, “Yee Haw.” We catch up to Dawn, who is now riding alone because she lost her riding partner at the first loop due to a horse cramp (dang, I hate that for her) She is telling me that this is the first time her horse had to leave camp alone and he’s handling it very well but she’s glad we came along to keep him motivated. She rides along with us for awhile. In the middle of this lollipop is a very steep, very deep clay muddy, hill switchback that we have to climb. When we did it the first time, I commented that after 100 horses go over it, it is gonna be a mess. Second time, Penny tried to charge up it but the mud had become so churned and deep (and sticky) that she was struggling to get her footing and purchase on the trail to push up it. On the left side of the trail is a cliff down the to trail below the switchback, I do not want to fall. On the right side is thick trees. Penny kept trying to get out of the mud onto the trail on the right side and I was working hard to convince her that would be even more dangerous and difficult. She got up it and I hear some carrying on behind me. Penny is reaching out and getting stronger as we go along. I can see that Dawn and her horse are not prepared to go these kinds of speeds and I try to settle Penny into a slower pace but she’s like, “Hey, I’m doing okay, let me work dumb lady.” We come into the common area and meet up with Evelyn, Jeff and Lauren. Uh oh, now we’ll be “on”. I look behind me and see Dawn, Jeff and Renee far far back and Steel is catching up to us. Oops, maybe we’re moving a little too fast. This loop is so much fun. Lots of single track trail. Also lots of mud. We didn’t have so much mud on the first loop, this loop is going to take some of the starch out of Penny Pony, to be sure. I was a little concerned for Steel because I knew she was working at a pace outside her comfort zone. I have complete faith is Ro, who has competed a lot of miles on Steel this year, to take care of her and slow her down if it was necessary. Rule number 1 in this sport. Ride your own ride. So we’re moving along and come out onto some gravel service road. Getcha kicks it up a notch and while Penny Pony is maintaining, I can tell this pace is starting to wear her out. She is not very strong yet, she’s only just started her endurance career, and I’m ready for her to slow it down a bit. I pull her up and wave good bye to Lauren and Evelyn. When they get out of sight, we start moving again. I do not see Dawn, Jeff and Renee coming up behind us so we’re in a pocket again. Penny works best in a pocket. I am enjoying this very much! Roa and I are having some bizarre conversations, she made a comment that cracked me up. We’re on a road called Chicken Coop Rd … and she said she was very disappointed that she didn’t see one single chicken coop on that road. And, as we get to the turn that takes us off the road and back onto trail, here comes Lauren and Evelyn heading towards us. Yep, they missed the turn. That was too funny, too. Penny, once again, was like, “Oh Yeah, let’s move out.” and she stayed on their tail through the single track. We came to a DIY cattle pasture gate and I held us up a bit there to let Lauren and Evelyn get out in front of us again. While I was enjoying that fast pace, I did not want to wear Penny and Steel out on the second loop. WHAT? I look it up when we get done with this ride and sure enough, it is! Wow! Fun times. Excellent trail. Superb endurance horses. Penny Pony and Steel and eating up the trail and before you know it, we’re in the second hold – which is an away hold. Specifically why I picked this ride as Penny’s first 50 mile ride. In the event she was very tired and didn’t want to go on the third loop, having an away hold means she has no choice but to do the third loop. So we did the last mile into the second hold eating and eating. Well, Penny and Steel are eating and eating. Ro and I are just along for the smorgasbord. We pass the second vet check with all A’s. Penny is remarkable and she’s still full of energy. She is also starving. As soon as we finish vetting and her pan of slurry is put in front of her, she dives in and doesn’t come up for air. When that’s gone, she starts eating the grass where we are setup and her head doesn’t come up at all. Not for a second during that entire hold. She’s eating like she will never be allowed to have food again. I decide that although both girls are eating and drinking well, we need to give them elytes and BCAA before we leave the hold. Ro concurs. Neither one of them wanted to pick their heads up out of the grass, even after we gave them the nasty tubes o’ poison. Oh yes, in Penny’s mind, elytes are poison. Too bad. Take your medicine and get over yourself. Time to go. Last loop. 12 miles. Easy Peasy. Wow, I didn’t expect that. She’s at mile 38 and she’s still going strong. “Uhm, let me think about this.” and she drops into a 5 mph, bone jarring, teeth rattling, jog. “Okay, but just for a minute.” I say as my arms fall off from the vibrations. Steel does not agree with this and she starts to pass Penny. “Oh no, I am the leader of this ride, get back witchy mare.” and Penny Pony picks up the pace. For about half a mile then she slows down again. “Hey, I’m thinking about this and it’s a trick.” Penny is walking and eating the grass along the side of the trail. Steel is like, “You dumbass, we’re almost done. We have eight more miles and we can eat all night.” and Steel starts to pass Penny. “Oh no, I told you I am the leader of this ride.” and Penny Pony picks up the pace. For about 1/2 mile. And before she can finish her thought process, two strange horses come along and pass her. HOLY CRAPOLY. Yes, I am now whining. Ro forgot to bring me cheese. Dammit. Penny was very upset that those two horses got out of sight. I didn’t care, I was not prepared to have her get a broken leg. And my foot is killing me so let’s just walk. Okay. We got through that nuddy section and guess what? COMMON AREA! Five more miles and we’re done. And Penny knew it. We drank and drank at the tubs of water. Even though it was cool out, I sponged her off as she was getting sweaty due to being tired, and then it was ..
Oh yes, last five miles Penny was back to her 12 mph trot. I was trying desperately to ride with a cramped foot and complaining ankle (I think the ankle joined in the fun because it didn’t want to be left out.) By the time we got into base, Penny was kinda trotting sideways, probably because I was posting on the right leg and keeping all weight off the cramped and complaining left leg. And we finished the ride at 3:15 pm. We left on the ride at 6:45 am. We have a 45 minute hold and an hour hold so we did her first 50 miles in 7.5 hours ride time. We started dead last out of 37 horses…and finished 20th. Not bad, not bad at all Penny! And (thank god) Dean was at the vetting when we went up so I asked him to please trot my horse. My foot is so cramped it feels like needles jammed in between each toe. I could have done my own trot out, I felt that good elsewise, but Dean is so kind, he did the trot out for me. Penny trotted out like she had not even rode 50 miles. The vet commented on it. I was not about to tell her that Penny had a lot of “in hand trotting” training for the show ring and when we ask her for a trot out she goes into her big show trot, so even when she is tired, she is flashy. I just grinned at the vet and said THANK YOU! ALL A’s AT THE FINISH! I did not expect that. No I did not. 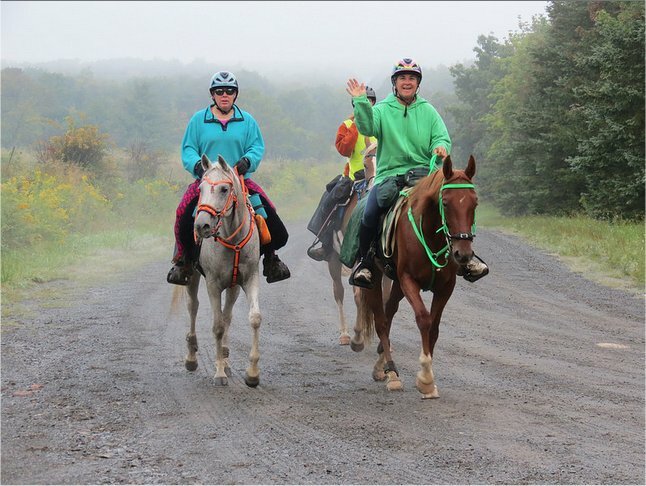 Penny performed like a seasoned endurance horse on her first official 50 mile endurance ride. 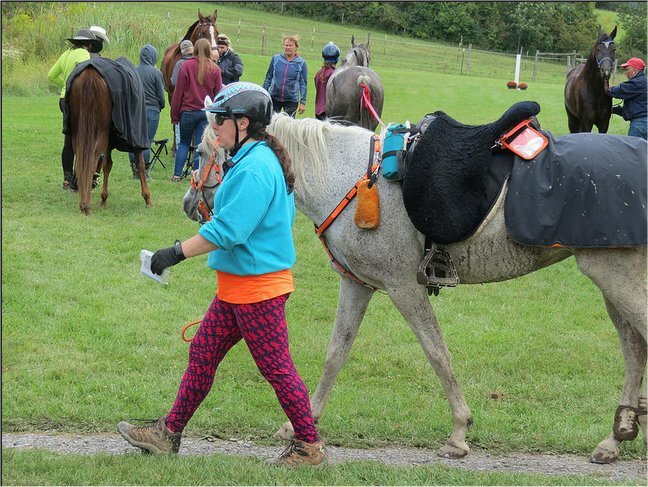 True story, she started this season on a 25 mile LD, of which I did not feel confident that she was 100% physically ready, and she rocked it (finishing 21st out of 35 – and yes, we left after all the horses were gone on trail, see story here) She’s been doing CTR’s and LD’s all summer and on her first 50 mile ride, she rocked it, finishing 21st out of 39. TOO FUNNY. These are AERC miles only. She has also completed 75 additional miles in ECTRA events. Bringing her annual total to 205 miles as of this ride. And me? 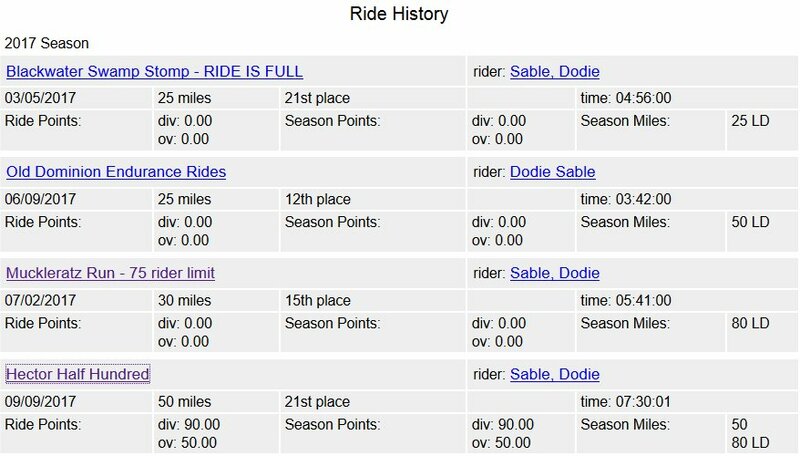 I have not ridden a 50 mile since a year ago August. (13 months ago) I was prepared for the worst and I got the best. No back pain at all during the ride. No hip pain during or after the ride. My stupid toes uncramped about 20 minutes after I was off Penny so that went away. Next day? Nothing. A little soreness in the calf with the cramped toes and some stiffness in the opposite leg thigh, and that was it. PENNY ROCKS! I know I feel so good because we mesh in our riding styles. I also suspect I feel so wonderful because she loves me as much as I love her. THANK YOU THANK YOU to Ned and Kelly Drey who passed Penny along to me. Penny loves you for it and I love you for it. She and I are the best team ever….and I have not said that since my stallion, Shark, was retired. He was (still is) my heart horse and Penny is as close to him as she can get. I love my Penny Pony.